ABOUT: Ferris cave is a large amphitheatre of naturally carved red sandstone with a small waterfall on rainy days and a lovely tree centre piece. Used by climbers it is a surprise find in the area, with lots of photo opps on the walk down. 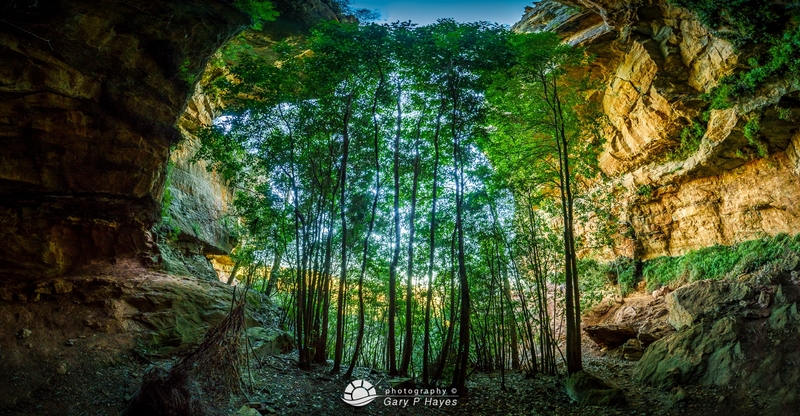 PHOTO EQUIPMENT TO BRING: The cave is large and if you want the whole in one shot a 14mm or wider is required. You can stitch shots together too. But a moderate wide can be used looking into the cave area or up through the trees. It is dark in there so a tripod essential. GETTING TO THE SPOT/S: Park at the top of Mt Piddinton near the toilets or on the small loop road around it and pick up the signs to Ferris Cave (see park map below). It is a loop walk but most of the left hand side of loop is wooded until some great viewpoints before the cave.